Learn how to add more insulation to your mechanical systems and save big on energy costs! Darrell Bunting is a Certified Insulation Energy Appraiser, sponsored by the National Insulation Association. "The Power of Energy Conservation through Mechanical Insulation"
by: Darrell Bunting, President, Iowa Insulation, Inc. 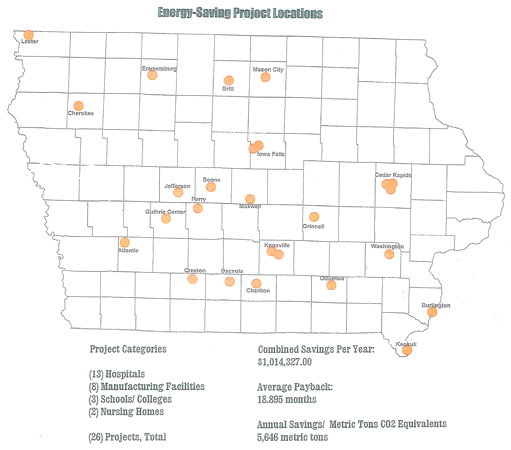 The US Department of Energy and Iowa Office of Energy Independence both include energy conservation in their policies. A good question to ask is, "How much energy can be saved through energy conservation?". The National Insulation Association has sponsored the Insulation Energy Appraisal Program to help answer this question. This program is a Best Practices Allied Partner of the US Department of Energy. Utilizing the 3E Plus computer program, energy losses can be accurately calculated by conducting site visits to perform energy audits and appraisals. Since June, 2001, I have been a "Certified Insulation Energy Appraiser". The goal is to identify missing insulation on mechanical systems, calculate the energy losses, and show customers how much savings can be achieved by adding more insulation. The result of adding more mechanical insulation is developing a powerful track record of success. 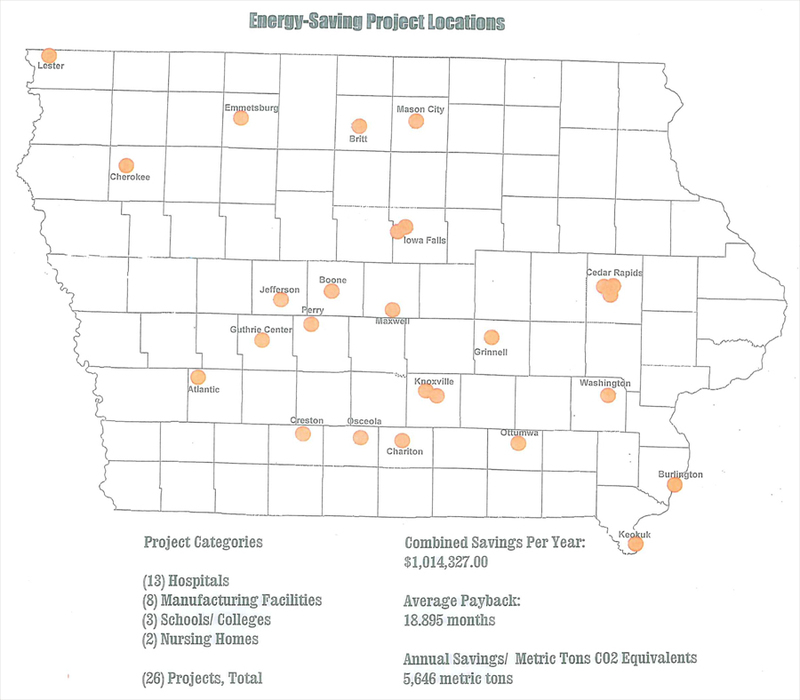 The attached map of (26) energy-savings projects in place around the state of Iowa summarizes the effectiveness of energy conservation. More than $1,000,000.00 per year in energy savings is being realized! The average payback is right at 19 months. The annual waste reduction in CO2 equivalents is more than 5,600 metric tons on 1,129,305 therms of natural gas. Energy conservation is demonstrated to be a powerful first step in energy independence. Adding mechanical insulation has fast paybacks and proven, powerful cumulative savings. In addition, there are many other benefits to adding more insulation to your mechanical systems. These include burn protection for employees, lower maintenance costs, extends equipment life, lowers ambient temperatures, improved process temperatures, reduced greenhouse gas emissions and improves the appearance of your mechanical rooms.